Kerri-Lyn Chong and Dustin Trudeau, fourth-year and third-year DMD students respectively, were honoured at the UBC President’s 14th Annual Student Leadership Recognition Reception held on April 5, 2018. The annual reception honours graduate and undergraduate student leaders from across the university whose outstanding achievements have positively contributed to UBC and the greater community. 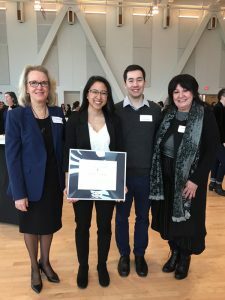 During the reception, Kerri-Lyn Chong also received the prestigious Edward JC Hossie Leadership Award, UBC’s highest award for students who have demonstrated exceptional leadership through volunteerism, community service and/or campus activities. Western Canada Dental Society Leadership Scholarship (2015) for demonstrating leadership. “She has been fully engaged in enhancing students’ learning experiences, inclusiveness and well-being,” Best says and outlines more of Kerri-Lyn’s leadership roles: she served as President of the UBC Dental Undergraduate Society, Vice President, Administrative Director, and DMD Class President. As a dental student representative, she sat on BC Dental Association’s Board and helped develop the student-dentistry mentorship program. She co-founded Sharing Smiles Day UBC Chapter and initiated UBC Dentistry’s Oral Health Total Health Chapter to join a national network to improve oral health education in people with disabilities. She mentored junior dental students in clinical simulation. As an ambassador for connecting dental students across Canada to promote dental education and access to care, she served as the Western Canada Representative on the Federation of Canadian Dentistry Student Associations. Kerri-Lyn’s commitment to excellence shined in her extra-curricular learning experiences in the Summer Student Practitioner Program, the Japan Dental Exchange Program and the RV Tucker Cast Gold Student Study Club. Dr. Leandra Best, Senior Associate Dean; Kerri-Lyn Chong DMD 2018; Dustin Trudeau DMD 2019; and Dr. Mary MacDougall, Dean of UBC Dentistry. Dustin has been involved with the Dental Undergraduate Society (DUS) throughout his years as a dental student: he was Year 1 DMD Class 2019 President (2015-2016), Year 2 DMD Class 2019 President (2016-2017, and Year 3 DUS Executive-VP (DMD) from 2017 to 2018. Next academic year (2018-2019) he will be the DUS President. Dustin has also been a member of the Dentistry intramurals for soccer, futsal, and basketball. He also found time in first year to work in Dr. Dieter Brömme’s lab for a project characterizing a number of inhibitors specific for the collagenase activity of cathepsin K.